Green Gate Access Systems has had a challenging year: it's original headquarters were destroyed by fire in June 2016 and the company was homeless, using temporary accommodation and portacabins until February this year when they moved over one weekend to start again at much larger premises in Boughton Monchelsea. 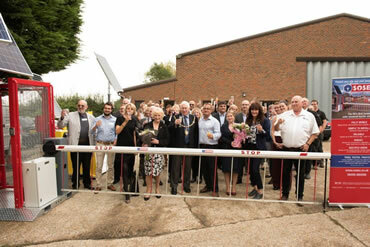 The new base has now been home to the company for six months and on 4th September they celebrated by inviting the Mayor of Maidstone, Cllr Malcolm Greer, and his wife to the official opening of the showroom, innovative training suite and the manufacturing unit for their new range of mobile, solar powered barriers. The event was a thank you to all of the company's staff, customers and suppliers who had supported them through a difficult time. Cllr Greer spoke of the growth potential of businesses in the Maidstone area and his admiration for companies like Green Gate who “take an idea and complete it”. He added that Green Gate Access Systems were exactly the type of business he wants to support during his time as mayor and highlighted their concentration on improving safety for work sites and highways through the design and manufacture of their SOlar SECurity and their plans to develop growth opportunities for young workers. Business owner, Neil Sampson gave a brief presentation explaining how the devastating beginning to the year had spurred him on to take his team and his business to the next level. He described how his team has worked incredibly hard to rebuild and grow the company after the fire and how he has prioritised staff needs at the new premises by providing better facilities including a new kitchen, gym and shower and toilets. Neil and his staff have enjoyed team building days and they are working together on future development plans. The presentations took place in the spacious new training suite which Neil Sampson has made available to the Door and Hardware Federation (DHF) for teaching its Automated Gate Safety Diploma training course to owners, managers and supervisors within the South East. 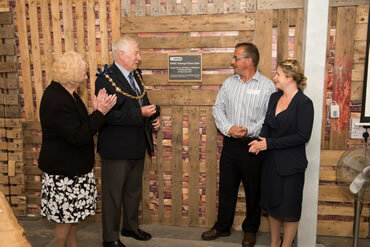 Neil also spoke about how moving into the new Boughton Monchelsea premises has brought forward Green Gate's transformation from a reseller of parts into a manufacturer. Employees are benefiting from the transformation, developing their skills and knowledge. The company has already started exporting to Australia and is looking towards a sunny future with growth both in the UK and overseas. The event was a great success with customers, suppliers and supporters enjoying the delicious Kentish ploughman's lunch and cream tea.